of the Ministerial Council on Education, Employment, Training and Youth Affairs’ (MCEETYA). Survey outcomes help inform educational policy in the participating countries, TIMSS also routinely collects extensive background information that addresses concerns about the quantity, quality, and content of instruction. TIMSS 2007 was the fourth in a cycle of internationally comparative assessments, conducted by the International Association for the Evaluation of Educational Achievement (IEA). You can look at the complete report by following the link below. Here is an interesting benchmark looking at the Year 4 Science: Performance at the Low International Benchmark, designed to be read with the accompanying illustration. The low international benchmark for science included knowing some simple facts about human health and the behavioural and physical characteristics of animals and humans. The item shown below presents an example of student achievement at this benchmark. Students were presented with a pictorial representation of four animals and asked to identify the animal most likely to live in the desert. On average internationally 68 per cent of Year 4 students were able to identify the lizard as the most likely desert dweller. 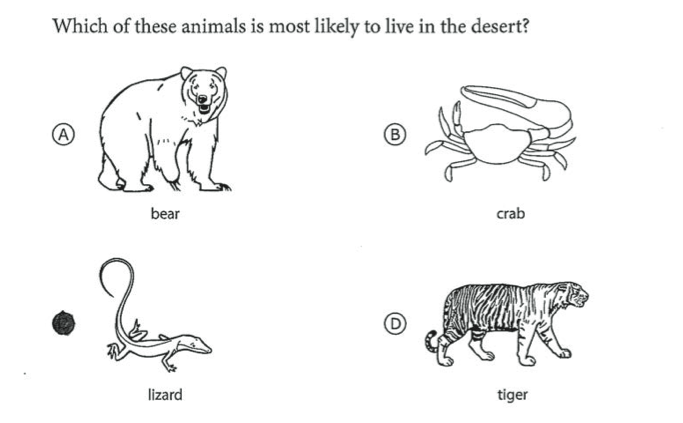 More than 90 per cent of students in the United States correctly answered this item, and 88 per cent of Australian students also identified the correct animal. This was significantly higher than the international average.